Home » Azul SkinHealth Blog » 5 Reasons We LOVE Mineral Makeup! 5 Reasons We LOVE Mineral Makeup! Do you remember the very first time in your life you put on makeup? Didn’t it just make you feel so… grown up? I loved that feeling, and still do today. But now that I am an adult, there are a lot more things to think about when it comes to makeup coverage. Picking the wrong kind of makeup, or going for a cheap brand, can actually cause my skin to lose the luster and glow that I want. If you are looking for the best kind of makeup for your skin’s appearance and health, you’ll want to give Azul SkinHealth’s Mineral Makeup a try! Although mineral makeup arrived on the cosmetic scene in the 1970s, the concept has been around for much longer than that. In fact, it’s been used for thousands of years! Before modern makeup, ancient cultures used to use minerals as the base for their cosmetics. Mind you, modern mineral makeup bares as much resemblance to its ancient counterpart as a Tesla resembles a horse and buggy. Also, you should be aware that not all modern mineral makeup is created equal, either. “Mineral makeup” has become a buzzword, a marketing gimmick that many use to boost sales. If you see “mineral ENHANCED makeup” anywhere on a container, you are probably not dealing with the real thing. But with Azul, you will find the highest quality, purest ingredients! All of our mineral makeup is formulated in association with Trilogy Laboratories, the company that creates all of our Azul SkinHealth products. Led by our own Dr. Kristen Flaharty, every Azul SkinHealth product delivers Azul-quality skincare in a handy take-home package, and that includes our mineral makeup. Here are some of the reasons we love Azul SkinHealth’s Mineral Makeup! As a society, we are becoming more and more aware every year of the artificial chemicals we are putting into our bodies, whether it be through food, medicine, or even makeup. Traditional forms of makeup usually contain a number of ingredients that aren’t normally found in nature. That isn’t the case with our mineral makeup. We make sure that we keep it simple and effective, only using natural ingredients that will give you the best and most natural-looking coverage you can get. For example, the cornerstone of our mineral makeup line, our Loose Powder Mineral Foundation, contains only five natural mineral ingredients: Micronized Titanium Dioxide, Titanium Dioxide, Bismuth Oxychloride, Zinc Oxide and Iron Oxide. All are minerals found in nature. Nothing more, nothing less! One of the biggest advantages of mineral makeup is that it’s safe for all skin types, including those with super-sensitive skin. Mineral makeup is hypoallergenic and contains no dyes, chemicals, perfumes or other artificial substances that can cause skin irritation or breakouts. When traditional makeup covers the skin, it can prevent it from breathing. But, as the ingredients used in mineral makeup are so gentle, they promote skin health and actually prevent the clogging of pores. This is especially great if you suffer from acne-prone skin. With the summer on its way, skin health is on our minds. In Florida, the sun is a blessing and a curse. Sure, it’s beautiful, but it can cause tremendous skin damage if you aren’t wearing sun protection. While we highly recommend using Azul SkinHealth Sun Protection, our mineral makeup takes it to the next level, because the thin layer of minerals in the makeup actually blocks the UV rays from penetrating your skin. Less is more, especially when it comes to mineral makeup. There’s no need to cake it on, as just a little mineral makeup can go a long way! Unlike traditional makeup powders, mineral makeup is light-reflective. So under bright light, it actually reduces the appearance of wrinkles and other fine lines on the face. This also makes it the perfect kind of makeup to use if you take a lot of selfies with a flash! Mineral makeup also doesn’t cake and build up inside fine lines and wrinkles, like a liquid or cream foundation can. The bottom line is that mineral makeup just looks more natural! Nothing is worse than spending a ton of money on expensive makeup products, only to discover that they expire before you have finished using them. You almost wonder if that’s by design, to force you to buy more of it when it expires. But, as mineral makeup doesn’t need to have the fillers, stabilizers, oils and other chemical ingredients that tend to expire, it can last far longer on your shelf, giving you the time you need to be able to use it all! Although the cosmetic skin procedures that we offer here at Azul can deliver fantastic results, we know how annoying recovery can be. After something like CO2 Laser Skin Resurfacing or even a microdermabrasion treatment, your skin will need a little extra care for a few days. During this time, you should avoid putting any kind of irritating substances (like traditional makeup) on it, so you can give your skin time to heal. Okay, but what if you need to leave the house, before your skin has had time to fully recover? That’s one of the reasons we are such huge fans of mineral makeup here at Azul. It’s perfect for sensitive, irritated skin, as it will allow your skin to breath and not block any of your pores. You should still wait a few days after a serious skin treatment to put on makeup, but when you do, you should make sure that it is mineral makeup. One minor word of warning, you should know that mineral makeup isn’t applied exactly the same way as traditional makeup. 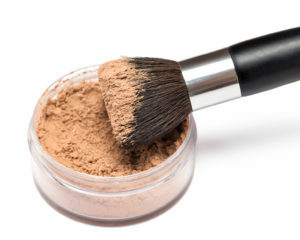 You should specifically use a mineral powder brush for the powder make up, and a slightly different technique than you may be used to. If you have any questions about how to apply mineral makeup, just ask me or one of our other experts here at Azul, and we can give you some tips on how to get your best results! We are extremely proud of our Mineral Makeup, as we are all of the products in the Azul SkinHealth line. If you’d like to stop in to take a look at everything we have to offer, we’d love to see you! Or, if you’d like to book an appointment for a consult for a surgical or non-surgical procedure, or visit our Medical Spa, you can give us a call at (239) 747-1148, or please visit our website at www.azulbeauty.com. Don’t forget to ask for your free consultation!